In June 2018, Pismo Beach will once again host the car show, The Classic at Pismo Beach. Our downtown will become a street show for auto buffs and car fans. Our city has a rich tradition of being a magnet for parades of autos going up and down the coast, dating back to the days of The El Pizmo Inn and Tent City when autos were making their debut on California highways. The auto and Pismo Beach were a match made in Heaven. Fed by a steady stream of travelers along the highway, for decades our signature lodging was motor courts and auto camps. As the motor lodges aged, the old cars became collectors’ items. Now, vintage vehicles return as show pieces and visitors to our city stay in beautiful hotels and vacation rentals like our Addie Vacation Beach Townhomes you see on this website. In 1986, the Pismo Beach Business Improvement Group, called ‘BIG’ for short, while pondering new ways to improve business and raise money to fund community projects, embraced an idea proposed by downtown businessman Paul Bailey. Being a collector of antique autos and a car show aficionado himself, Paul Bailey was familiar with car shows. Not only did he offer to chair the event and enter five show cars, he offered to underwrite the event to make it happen. He volunteered, funded it, and asked only that, if the car show made money, he be repaid. According to Paul Bailey and 1987 BIG president Les Splear, the first car show was June 28-29, 1986, and was put on entirely by volunteers. It attracted 300 entries and 10,000 visitors. It was such a success, it made enough to pay Bailey back as well as put a couple of hundred dollars in the treasury. Les Splear reminisced that so much work went into it those first few years of the car show, he wondered how they ever did it. They developed the program, solicited the entries, advertised, made fliers and instructions, — printed programs, banners, lapel pins, souvenir buttons, — had a BBQ and dance, with $3,000 in raffle prizes, — marked the streets, coordinated food and vendor booths, scored the ballots, managed the judging and presented the awards — all with no paid staff and no computers. City employees volunteered, the Chamber of Commerce pitched in, and the Moose Lodge put on a pancake breakfast. Mayor Nebb Eldwayen welcomed everyone to town. At the 2nd show, Bailey sponsored celebrities like astronaut Gordon Cooper and had a quick draw shoot out on Cypress Street in front of Harry’s Bar. After a few years, volunteer Glo Rivera and her family-run RocGlo promotion company contracted with BIG to run the event. She reported in 1989 that the event took 12,000 hours, beginning a year in advance and utilizing over 100 volunteers. She ran it until 2004, always donating a portion of the proceeds to local festivals and events. By 2005, when the city contracted the show to Just Cruzin’ Promotions, it had earned its place as a major annual event for the city. Just Cruzin’ made it even bigger and in 2007 featured the Budweiser Clydesdales. It has grown from estimates of 10,000 visitors to 170,000 visitors. 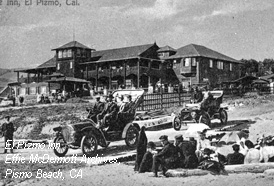 This photo of El Pizmo Inn, taken around the turn of the last century, shows National and Tourist automobiles cruising gingerly onto the beach at the end of Pomeroy Avenue. In this photo, they traverse a wooden-planked roadbed at the end of Pomeroy as they ease into the sand to follow the ruts of the pencil-thin tires of those who preceded them driving along the surf line. Sitting on logs on the sandy beach with a parasol and in their Sunday-go-to-meetin’ clothes are the car show enthusiasts of the day, taking it all in. The seawall and boardwalk block this access to the beach now, but the car is still king in the streets of Pismo Beach come car show time. It’s just a little bit of the hidden history of Pismo Beach. Thank you, Dan. Your photography is amazing! !